On December 14, Martin Griffiths—the UN Special Envoy for Yemen—briefed the UN Security Council about the talks that had just concluded in Sweden the previous day. Griffiths, sitting before a large UN logo from Jordan, spoke by video to a Council that had not been able to move an effective agenda to end the brutal war on this impoverished country. Griffiths, who worked on each failed UN effort on Syria over the past decade, had been appointed to this post only in February, just after Mauritania’s Ismail Ould Cheikh Ahmed opted out of the impossible job that he had held from April 2015 to February 2018. No amount of talk had been able to bring the parties together. No amount of dialogue had convinced Saudi Arabia and the United Arab Emirates to stop the harsh bombardment of the country. And, no amount of pressure had moved the United States and the United Kingdom to stop providing logistical and military assistance to the Saudis and the Emiratis. The study points out that “armed conflict remains the main driver of food insecurity in Yemen.” That’s an obvious point, but it needs to be made. The war on Yemen has to end to prevent the near-death of the Yemeni people. The deal in Sweden was signed on Friday. By Saturday night and into Sunday, the crucial port of Hudaydah was hit by airstrikes by Saudi and Emirati jets. Gunfire ran across the city. Not even 24 hours would go by to preserve the peace. A senior UN official told me that such accords do not come into place immediately. They take time to settle in. The official date for the start of the ceasefire is Tuesday—December 18. But Yemen does not have the time. Near-famine is as bad as famine. Annihilation of Yemen remains in the cards. The day before the talks in Sweden ended, the United States Senate voted to end U.S. assistance to Saudi Arabia and its allies (including the United Arab Emirates) in their war on Yemen. The bill was sponsored by Bernie Sanders, the socialist from Vermont. 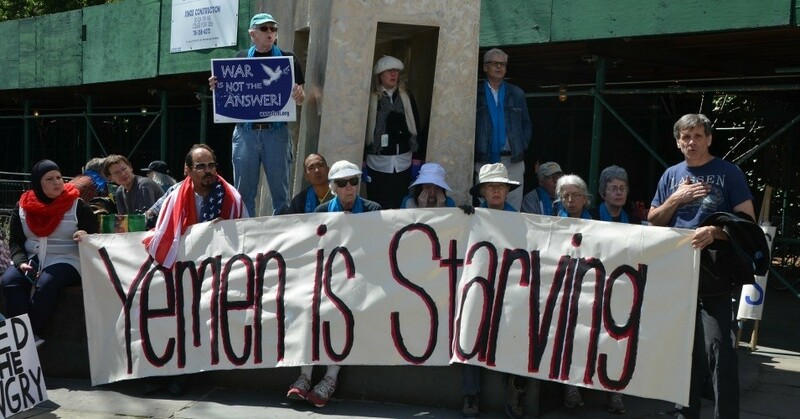 Thanks to pressure from the U.S. peace movement—including Code Pink—and the Yemeni diaspora—such as Professor Shireen Al-Adeimi—56 senators agreed that the United States must not support this war. This is a very important statement to the capitals in the Gulf. It is to be seen if the United Kingdom will also make such a statement. But—and there is always a but involved here—how will the U.S. specifically make sure its vast military assistance to Saudi Arabia is not diverted to the war on Yemen? Between 2013 and 2017, Saudi Arabia bought $9 billion worth of U.S. weapons—substantial parts of it now used in Yemen. Further, journalist Samuel Oakford has documented the ways in which the U.S. has—in relatively anonymous ways—supported the war effort. Recently, Oakford and Ryan Goodman (a lawyer formerly for the U.S. Defense Department) foundthat the Saudis and the Emiratis owed the United States $331 million for refueling services toward their war on Yemen. Many more such services are doubtless buried. The U.S. Senate vote sends a strong message, but whether it will have an impact on the entanglements between the U.S. armed forces and those of the Saudis is to be seen. It will require considerable vigilance by the U.S. Senate to make sure that collaboration is not ongoing. No such appetite is available in the Trump administration, which is eager to continue to support the Saudi regime regardless of war crimes and crimes against humanity. As part of the UN process, Griffiths announced to the Security Council that a team of UN peacekeepers will arrive in Yemen this week. They will be led by the retired Dutch Major General Patrick Cammaert, a man who has been on several UN missions previously. Recently, Cammaert led the team to investigate the failure of a UN peacekeeping force to protect civilians in South Sudan. Cammaert’s report criticized the mission for its “chaotic and ineffective response” during fighting in Juba, South Sudan, in July 2016. Based on the report, the UN Secretary General fired the commander of the force. When women were assaulted in plain sight in front of the UN troops, they did nothing to intervene. Cammaert’s report whitewashed this aspect of the investigation. He is, as people in the UN say, fiercely loyal to the UN and to UN peacekeeping in particular. It is hoped that his loyalty to the institution does not blind the new mission from its broader goal—to make sure that the deal on Hudaydah holds. Haykal Bafana worries about the entry of the UN peacekeeping force. “Composed of foreign troops,” he told me, the force “will be a dangerous new dynamic that may just start a completely new war in Yemen.” There are so many guns in Yemen, so much more mayhem possible. Saudi Arabia and the UAE still have a lot of money. They have used this money liberally through the UN system—helping fund this relief operation and that. Even now, the UN Envoy Griffiths had to thank Saudi Arabia and the UAE—bizarrely—for their injections of foreign currency to stabilize Yemen’s rial and their funds toward relief for Yemen. In March, the Saudis and Emiratis gave nearly US$1 billion to the UN, with the architect of the Saudi-Emirati war—Crown Prince Mohammed bin Salman—standing with UN Secretary General Antonio Guterres in Geneva, smiling as the check was handed over. The Saudis and the Emiratis bomb Yemen and then they help to fund the relief. There is very little room for maneuver in the UN system to be critical of Saudi Arabia and the UAE. China has long said that it wants the war to end. The war has interrupted China’s ambitions to move the One Belt, One Road project into the Gulf, with Yemen’s Bab el-Mandeb Strait as a central avenue for the movement of Chinese goods and Gulf oil. China oscillates in its views on the conflict—on the one side taking positions on the war and on the other saying that it merely wants stability in Yemen. Early in the war, for instance, China pressured Pakistan not to send troops into Yemen to fight for the Saudis. Then later, China appeared to back the Saudis’ proxy, former Yemeni president Abdrabbuh Mansur Hadi. China has called for a “Yemen-led, Yemen-owned” peace deal. The agreement in Sweden is the start of such a process, say Chinese officials. China’s Permanent Representative to the UN, Ma Zhaoxu, said that the ceasefire must hold, and that Yemen must be prevented from further collapse. A decade ago, the Chinese tried not to involve themselves in the political entanglements of such crises. Even peacekeeping does not go well. There were Chinese peacekeepers in Juba, when the UN did not act to protect civilians. Now, China is much more eager to assert itself across West Asia—even in Yemen. In Beijing, officials do not say more than that they will do all they can to help protect the future of Yemen. China’s foreign ministry spokesperson Lu Kang said, “We are willing to continue to play a constructive role to resolve the Yemen issue.” Whether China can use its considerable influence in Saudi Arabia to bring this war to a conclusion is to be seen. Certainly, the Chinese—unlike the United States—have far more reason to see the war end. They are not beholden to the Israelis or paranoid about Iran. The Chinese view is simple: war is bad for business, and life. That much is true.